Pumpkin Cinnamon Spice Cake with Cashew Cream Cheese Glaze is delicious and easy to make. It’s the kind of cake you dream of and wake up hoping there’s a slice left. This cake causes most folks to wish they’d asked for more than a disciplined sliver and persuades many to indulge in that second piece. And best of all, most everyone can enjoy this cake since it’s wheat, dairy and gluten-free! And to make things even better, as mentioned, it’s also one of the easiest cakes we’ve ever baked! 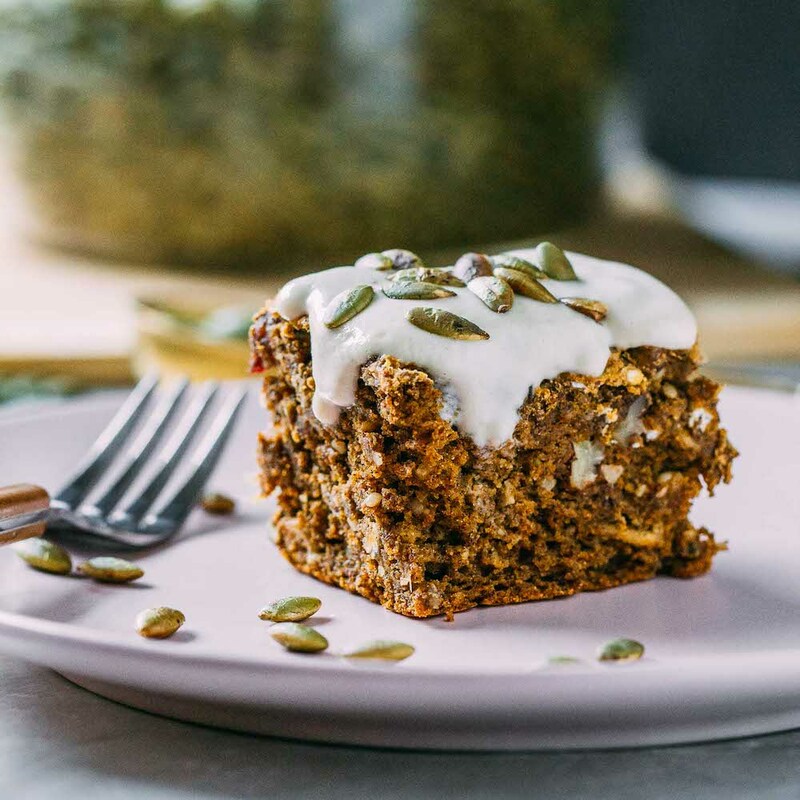 One reason Pumpkin Cinnamon Spice Cake with Cashew Cream Cheese Glaze is simple to create is that the ingredients are pretty basic pantry staples. You likely already have everything you need to make this delicious cake! Another reason Pumpkin Cinnamon Spice Cake with Cashew Cream Cheese Glaze is an easy cake to make is that the ingredients are listed in order of use to make this recipe super easy to follow. Not to toot our own horn but not every recipe can say that they’re easy to follow. The warm flavors of this cake are ideally suited for cool seasons like Fall and Winter. But you could also make it in the middle of summer, and I guarantee nobody would complain. During the Thanksgiving and Christmas holiday seasons it fits in like crunchy leaves, hot chocolate and snow globes. Dates and a dab of pure maple syrup are what we use to sweeten this cake, and that means this recipe is refined sugar-free! 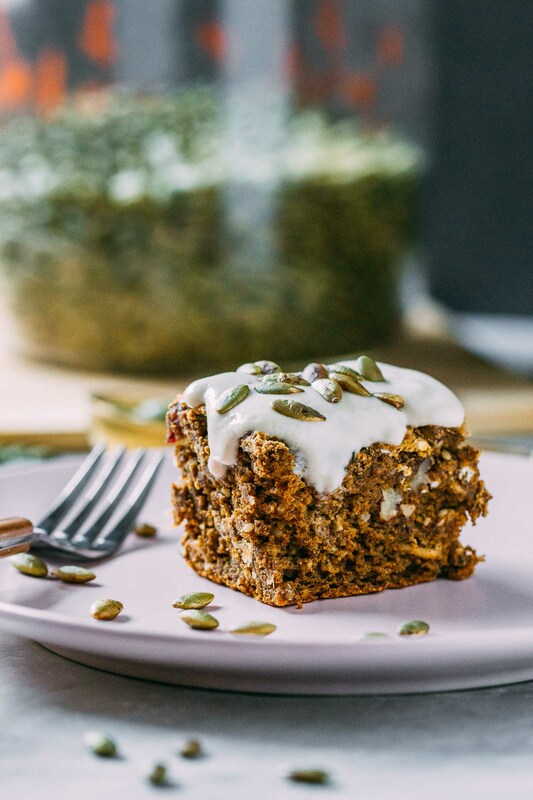 Sweetening with wholesome ingredients makes the carbs in our Pumpkin Cinnamon Spice Cake with Cashew Cream Cheese Glaze more readily converted into body-fueling energy. 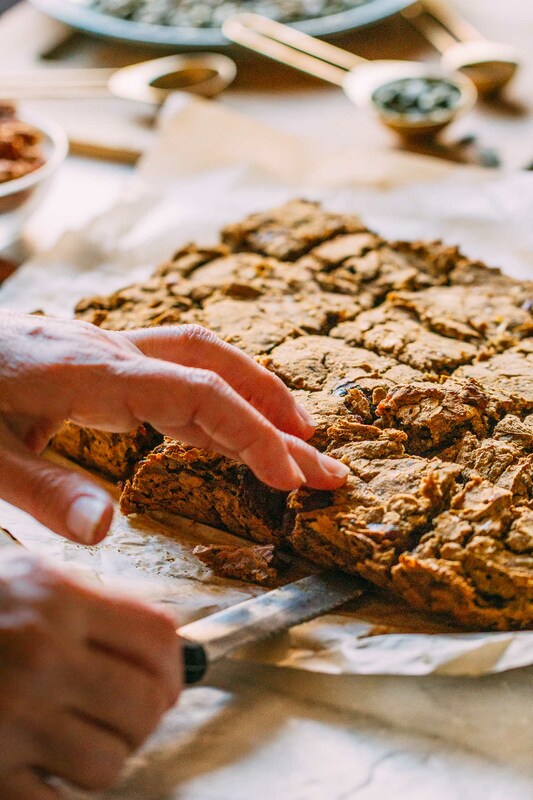 Now let’s dive into ways to describe the show-stopping taste of this plant-based, vegan, gluten-free, refined sugar-free, wheat-free, whole food plant-based, oil-free cake! and the cinnamon elevates the pumpkin flavor without taking over the whole taste experience – Now, that’s nice! And the Cashew Cream Cheese Glaze tastes as its title describes. By soaking the raw cashews, the glaze becomes even creamier. And FYI, soaking raw cashews also helps them digest more easily. This glaze is sweetened with pure maple syrup making it refined sugar-free just like the cake! For brightness and to add a hint of cream-cheesy goodness, there’s a tablespoon or so of lemon juice in the glaze. Lemon juice is a secret weapon in our kitchen. If ever need flavors to rise to the occasion but just can’t put your finger on precisely what needs to happen to accomplish that movement, try a squirt of fresh lemon juice. Finally, a personal anecdote about this recipe. My Mom, who never described herself as a good cook was, in fact, an excellent cook. She used simple, everyday ingredients and created meals and sweets that we will remember fondly forever. Her pumpkin bread was fabulous, and her spice cake was always tender and lite. This recipe is the happy marriage of those two precious memories. PIN this recipe to be sure and have it handy for when you’re ready to bake. And do leave a comment when you find out for yourself how delicious it tastes, and take a photo to share and tag it #goveeg. Pumpkin Cinnamon Spice Cake with Cashew Cream Cheese Glaze is incredibly delicious yet super easy to make. 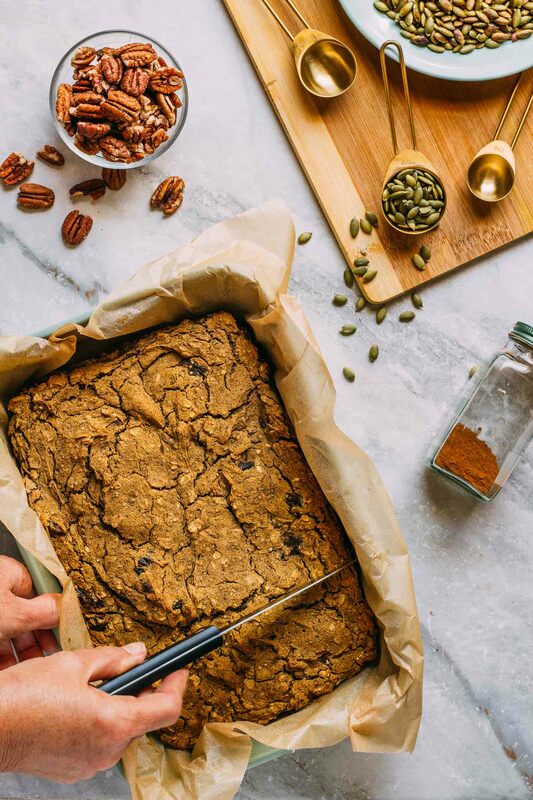 Practically everyone can enjoy a slice of this cake since it’s whole food plant-based, refined sugar-free, vegan, dairy-free, refined oil-free, and gluten-free! And to make things even better, as we’ve mentioned, it’s also one of the easiest cakes we’ve ever baked! And if you ask us, the tastiness of this cake makes this undeniably a recipe you’ll return to again and again. 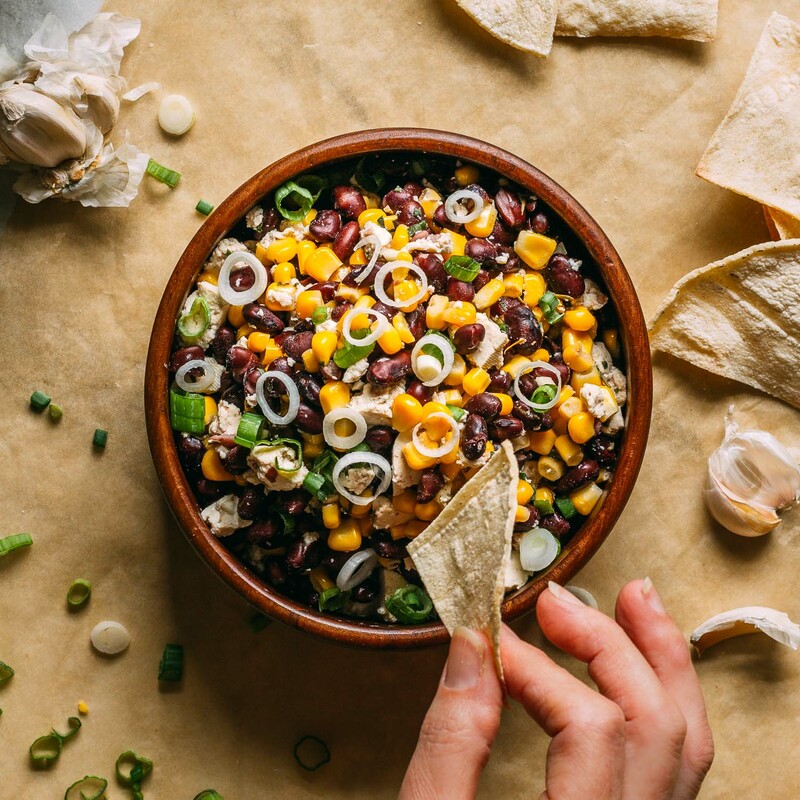 This recipe makes enough for about twenty small portions, or can easily be portioned into larger, more generously-sized pieces, based on preference. Also, serve this for dessert or enjoy it for breakfast along with a warm cup of coffee or tea. We’d best describe this delight as a twist between a cake and a homey load… enjoy! two flax eggs - Make your flax eggs by combining 3 tbsp of ground flax seeds or flax meal + 6 tbsp of water, set-aside and chilled. 1/2 cup of unsweetened plant-based milk - We used plain, unsweetened almond milk. 1/2 cup of old-fashioned oatmeal - Make sure it is labeled gluten-free like this brand that we use if gluten is of concern. 1 cup of gluten-free flour blend - We've had great results with this one by Bob's Red Mill. 1 1/2 cups of pumpkin puree - We use this organic brand whenever possible. 1/2 cup of chopped pecans walnuts or seeds of choice - We used these pecans. one batch of our delicious Cashew Cream Cheese Glaze - For the glaze blend the following in a high-speed blender: 1 cup of cashews, (soaked and drained,) 1/2 cup of filtered water, 1/4 cup of pure maple syrup, 2 tsp of pure vanilla extract, 1/4 tsp of pink Himalayan sea salt, and 3 tsp fresh lemon juice. Begin by stirring the flax egg mixture together and set it aside to chill in the refrigerator. 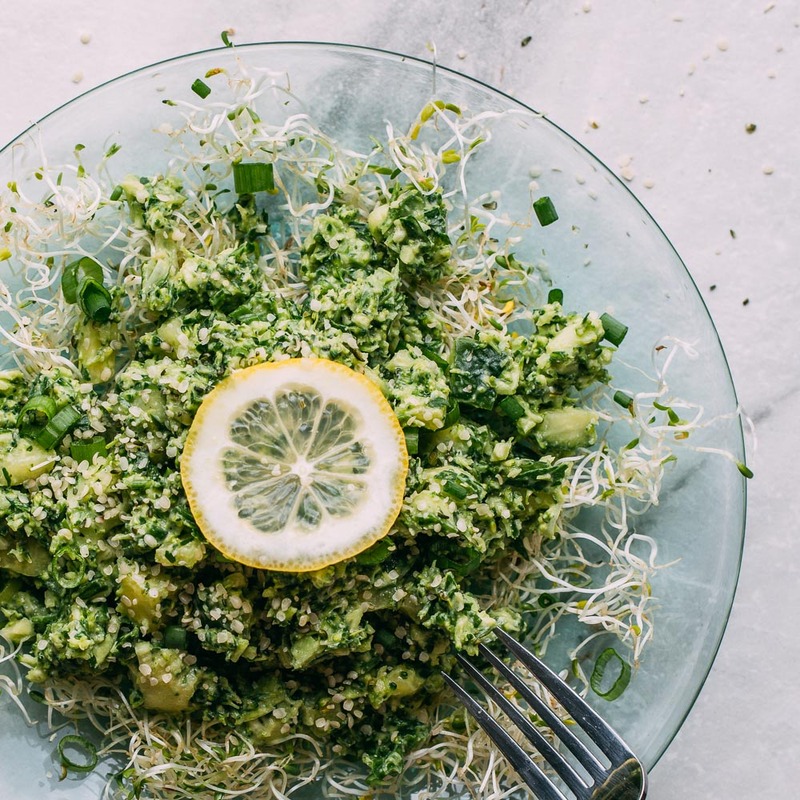 Then, in a small bowl or liquid measuring cup, combine the plain plant-based milk and lemon juice. Set this mixture aside. There's no need to chill. In a large mixing bowl, combine the dry ingredients (the next six on the list) in a large mixing bowl. Stir to distribute everything evenly. Now it's time to preheat your oven to 375º Fahrenheit. We waited until now to mention preheating the oven to conserve energy and avoid filling your kitchen with heat before necessary. Since we work out of sunny Florida, keeping the kitchen cool is kind of a big energy sucking deal. Next, in a blender, mixer or food processor, add the dates and remaining wet cake ingredients, as well as the plant-milk and lemon juice mixture and combine at medium-high speed until everything is united. Pour the blended wet mixture, the chilled flaxseed eggs, hand chopped dates and nuts into the dry ingredients. Stir well, but there's no need to over mix. The batter should be on the thick side, between that of a typical bread and a cake. Now, scrape the mixture into the parchment lined or sprayed baking pan. Bake for about 35 to 40 minutes, depending on your oven. 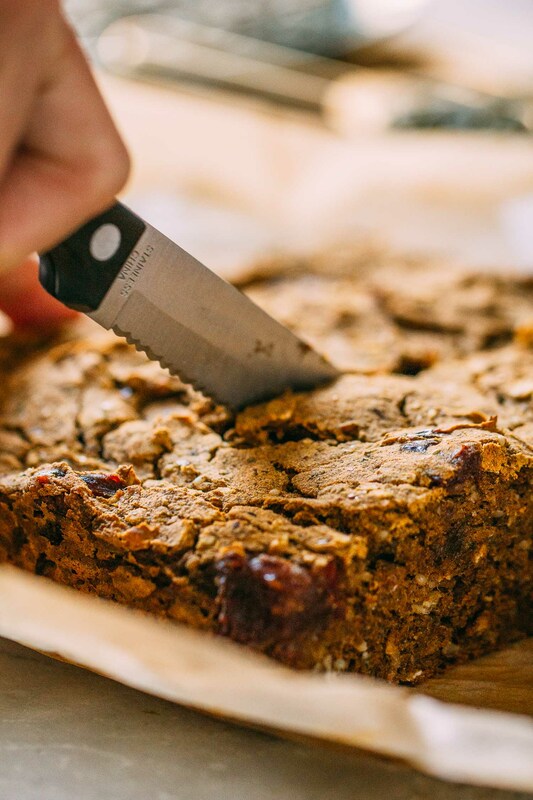 Your gluten-free and refined oil-free Pumpkin Cake is finished baking when a toothpick or butter knife poked in the center of the cake, comes out relatively clean. Serve warm, cold, or whatever temperature, you enjoy your cake the most but be sure to make our Cashew Cream Cheese Glaze and top each lovely slice with a few pan toasted pumpkin seeds! For best results, it's essential to spoon flour into measuring cups rather than scooping directly into the flour with the measuring cup itself. Spooning the flour will reduce the risk of using too much flour which gets packed into the measuring cup when you use the measuring cup to scoop directly into the flour. It only takes a few more seconds, and it's worth it to spoon. 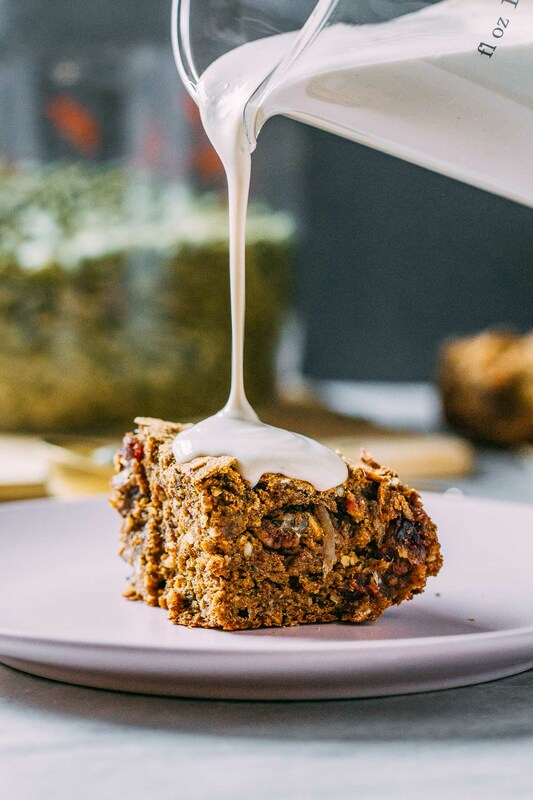 While toasted pumpkin seeds are the recommended topping to crown our heavenly whole food plant-based, gluten-free cake, walnuts, pecans, chia seeds or hemp seeds are alternative toppings that would also compliment the cake and Cashew Cream Cheese Glaze, nicely. 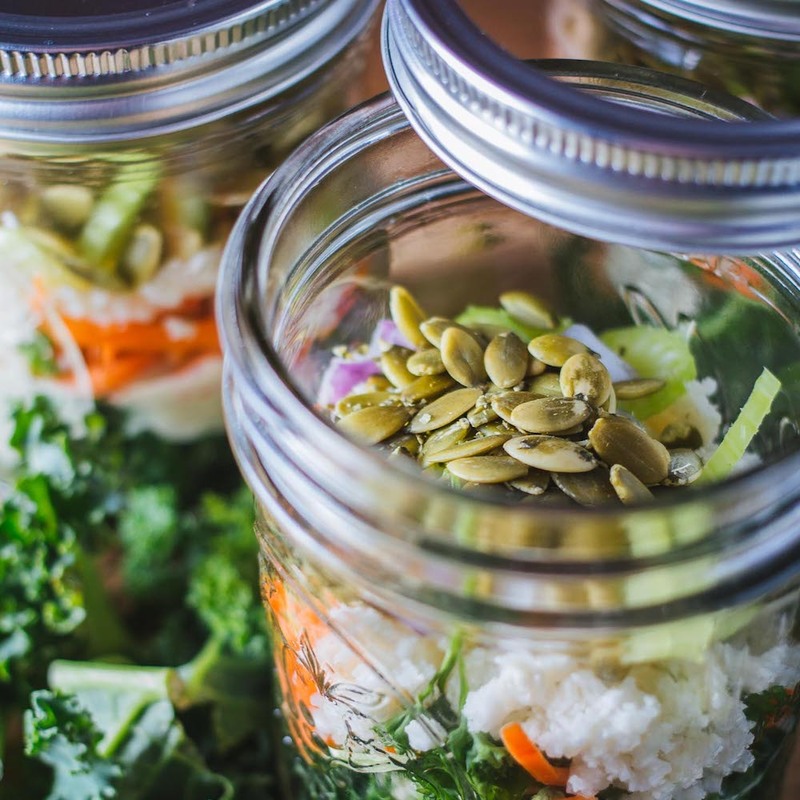 Hi, I’d like to make this for thanksgiving but can’t find hemp seeds. Will it matter if I leave them out? Should I substitute something? Leaving out the hem should work just fine, Karen, or if you like, you could grind a few of your favorite nuts or seeds up super small to take their place.